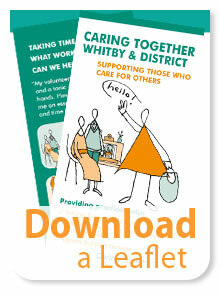 Caring Together Whitby has a proven track record of providing high quality services and activities for carers and older people. This is a wonderful opportunity for the right candidate to manage and develop the Sitting Service and My Neighbourhood service. Good communication skills are vital, and you will need to be organised, self-motivated and enthusiastic. Car User essential. 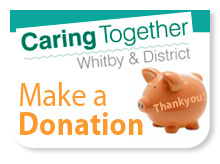 If you or your family and friends shop at Whitby Co-op please support us! We are pleased to announce that we have been nominated as one of the Co-ops 'Charities of the year' until November 2018. If you, your family or your friends shop at the Co-op please ask them to opt to give us their donation, raised by members purchasing Co-op 'own-brand' items. We can also receive a donation from money raised from 5p carrier bags; or from families using the Co-op Funeral Services. This is an easy way for people to help us, without any cost to themselves and we'd be very grateful for any donations at a time when we face funding cuts. Please help if you can, and tell your friends!! So far we have benefited by approximated £300 from the Co-op sponsorship; with another donation promised in the next month. If you haven't yet nominated us for support, please do so - and we are pleased to hear we will gain additional monies from their new scratchcard initiative. Thank you to the Co-op. We appreciate it. In April, 20 clients, carers and volunteers were hosted for a cream tea at the Raven Hall Hotel at Ravenscar. It was a scorching day and the views were gorgeous - as were the cream scones and silver service. A real treat. 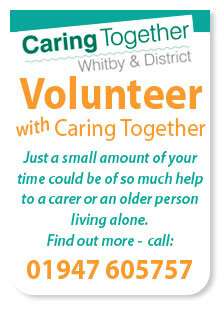 In May, 14 Caring Together clients and carers went to the Mallyan Spout at Goathland for morning tea and cakes. Again, a lovely day which was enjoyed by all. Many thanks also to Dave from Community Transport for his help to make it accessible to all. In June, Sue arranged for clients, carers and volunteers to have tea and cakes at Pannet Park Museum. Again, this went well and clients and carers appreciated the current art exhibition, the museum and the gardens. We realise that many of you are visiting people with a degree of dementia and we want to organise some sessions for volunteers to support this role. * a 'Dementia Friends' session - thank you to Debbie and staff from the Alzheimers Society for the session which was very interesting and helpful; much appreciated by our volunteers. As a large number of referrals are from people experiencing a degree of dementia, this is becoming increasingly relevant to us all. We have also had some new volunteers, and we want to put on an induction session in April or May to welcome these new recruits. - but we would also like to invite some 'old timers' as a refresher and chance to talk about the volunteering role and give new recruits some ideas for their visits. 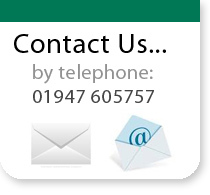 “I do feel that Caring Together understands my needs.” A comment by a user of our services.